Why is my water use high? To ensure that recycled water is not confused with drinking water, the colour purple is used to identify pipes that carry Class A recycled water. The purple colour alerts plumbers doing any work in the future that the pipe carries recycled water. The pipes that deliver recycled water to your home will either be purple in colour, black with purple stripes or wrapped in purple plastic, depending on the pipe material. Similarly, the recycled water service pipe into your property will be copper with a purple sleeve or a solid purple-coloured polyethylene pipe. These taps are to be installed at the time of construction and must have removable handles, which allow the handles to be stored separately to prevent accidental drinking of the recycled water, particularly by young children. These purple taps have different threads and you will not be able to replace them with a conventional garden tap. The outlet thread, however, is the same so you will be able to use normal hose fittings. We suggest you talk to your local hardware or garden centre if you think they need to be replaced. 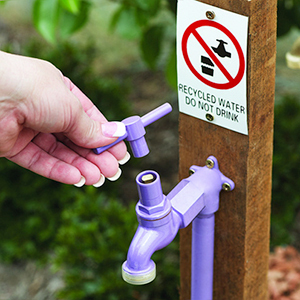 Warning signs with the words “Recycled water – Do not drink” must be fixed above each purple tap. These signs are to be installed by the plumber during house construction. The signs may not be removed and must be legible at all times. Purple tap kits including warning signs are available and replacement prohibition signs may be purchased at your local hardware store. We proudly acknowledge the traditional custodians of the land on which we work and live, and pay respect to their Elders past and present. We recognise and value the continuing rich culture and the contribution of Aboriginal people and communities to the Victorian community.